Welcome to beer tasting inspired by the 183rd Munich Oktoberfest! Limited places available. Free cancellation of registrations till October 25 or up until places available. Event is organized in cooperation with German-Baltic Chamber of Commerce and Danish-Estonian Chamber of Commerce. 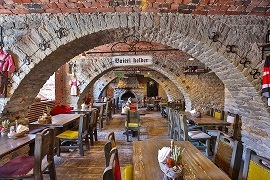 Modern German restaurant in the city center of Tallinn.